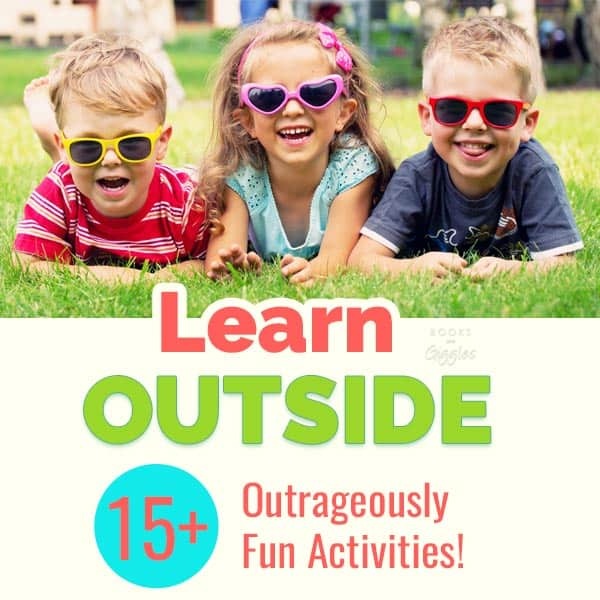 These outdoor educational activities will surely make learning fun this summer! Sometimes changing the environment is all you need for little minds to absorb what you’re trying to teach. 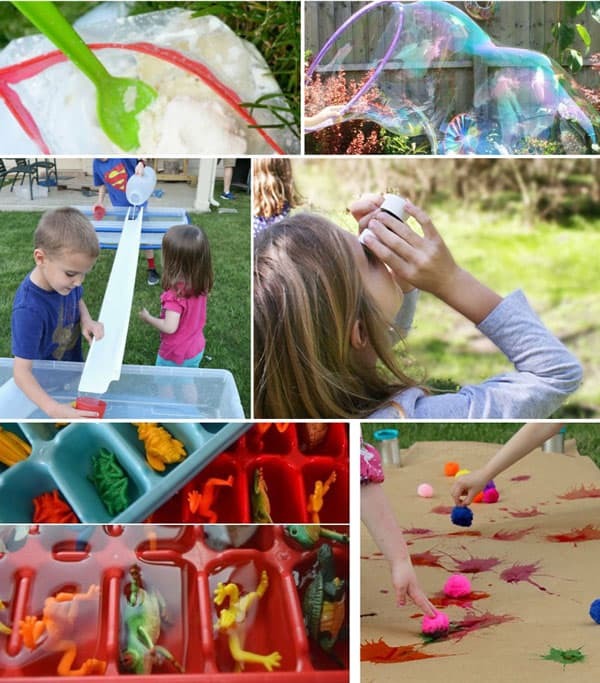 These 15+ Outrageously Fun ideas are perfect for spending tons of time outside this summer yet still preventing the dreaded summer slide. When I taught 5th and 6th grade, I knew that my students learned more through hands-on experiences and projects than they did with worksheet-type activities. I believe that’s even more strongly the case with younger kids. Each of the following outdoor learning activities has a learning aspect to it. Some of them are more explicitly educational, but all of them will provoke learning. STEM (Science, Technology, Engineering & Math) goes perfectly outdoors! The sun CAN cook things. A DIY Solar Oven is a super-fun project, and easier than you might think. You can make some yummy snacks with your kids with a science lesson not too far behind. 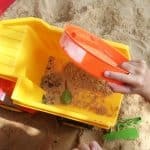 Building and constructing can be so incredibly fun for kids, especially when it has to do with water. This Rain Gutter River with running water is fun to build and fun to play with! These ice cubes are filled with little critters and it’s the perfect destructive yet controlled activity when it’s super hot outside. Mother Nature is all around us, in the form of plants, grass, dirt and of course trees. Trees lend sticks to us that are perfect to play with. Check out how your kids can make their own life size maze using only sticks. I can imagine this would lend to many hours of fun play. Do your kids love searching and hunting outdoors? This Printable nature Scavenger Hunt is perfect for those that love being in nature and exploring the world around them. Another super fun DIY treat is Ice Cream In A Bag. When the instructions are followed the ice cream can be just as good as the stuff in the carton, plus the fun and love that went into making it yourself. Bubbles are many children’s favorites from the days of teeny tiny toes. This giant bubble recipe is so fun for kids of all ages. Warning: may cause squeals of laughter. I liked this resource for ideas on how to bump up the learning aspect of bubble play. I love this number rock activity. Not only is it easy to set up and you can take it practically anywhere, but can be used in so many different types of number activities. Science is everywhere, even in your child’s favorite park. 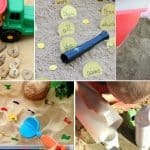 Take these fun learning ideas with you the next time you have a play day at the park and you’ll be adding in learning in no time and with very little effort! I love that these 9 Outdoor Math Ideas take so much of the outdoors and add math to it. When I am trying to learn or focus, I do my best work outside and I think that is the same for kids. 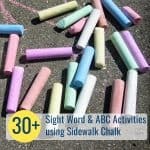 Sidewalk chalk is for more than just doodling, this Life Size Drawing activity can connect a child to a variety of books while enjoying drawing in the outdoors. Do your kids love playing with squirt guns? I know mine do, except I don’t always love being their target. Switch it up and give them a fun ABC target. They’ll have fun, learn and you can stay dry! 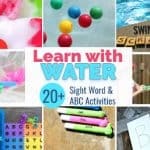 If you’re looking for another alphabet centered activity, this Outdoor Letter Hunt is perfect for your preschooler. They’ll get in physical activity while practicing letter recognition as well. Without school to keep our kids’ minds going, excess energy can build up fast. These super fun jumping games can help keep your kids active, outdoors and get those wiggles out fast! The hula hoop was one of my all time favorite childhood activities. My kids love theirs too, and these Hula Hoop Games would step up the fun and learning even more! Outdoor learning would not be complete without art! This fun and active art activity is great for children who love color and making ‘messes’. Summer is a wonderful time to play outside. Soaking up the sun is the perfect canvas for learning. 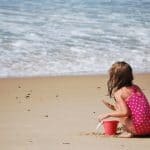 These fun outdoor activities will give you and your kids the perfect opportunity to have sun rays on your skin, fun all around, and keep your kids’ brains working. These are great ideas. We could try a different one each day! You could! It’d be the best summer ever!